Birthday of King Harald V of Norway is an official flag flying day in the country. 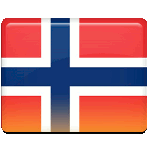 On the occasion, the state flag of Norway must be flown by all branches of government and state agencies. Future King Harald V was born on February 12, 1937 to Crown Prince Olav and Princess Märtha of Sweden. He was the first prince born in Norway since Olav IV, who was born in 1370. At the time, only male heirs could succeed to the throne, thus his birth guaranteed the line of succession. In 1957, his father succeed to the Norwegian throne, and Harald became the Crown Prince. In 1968, Crown Prince Harald married Sonja Haraldsen, the daughter of a clothing merchant. His marriage to a commoner sparked much controversy in the Norwegian society. Harald succeeded to the throne on January 17, 1991 upon his father's death. He was consecrated on June 23, 1991. Harald V is the first King of Norway named Harald since Harald Gille who reigned from 1130 to 1136. King Harald V is the formal head of the Norwegian Armed Forces and the Church of Norway. As Norway is a parliamentary constitutional monarchy, his official duties are primarily ceremonial. King Harald and Queen Sonja have two children, Crown Prince Haakon and Princess Märtha Louise.